Although Standard Poodles are usually natural water dogs and love swimming, my previous Standard Poodle only liked it if his feet could touch the bottom – – I guess you’d call it wading. Since we’ve had some very hot days this past week, the lake finally warmed up enough for us to go swimming, so on Friday afternoon we decided to take our first dip of the year and of course we brought Truman. He loved the water and caught on to swimming immediately. Soon he was swimming out to deeper water with great joy, retrieving sticks that we’d thrown. Only a few days ago I gave him a very short haircut – – it made me sad to say goodbye to his fluffy, luxuriant puppy hair – – but I was getting tired of bathing him and brushing out the tangles on a daily basis after he went exploring in muddy areas around our property. The shorter cut makes what I hope will be daily swims in the lake all pleasure for him and low maintenance for me. This past week while people in my home town sweltered with high heat and humidity and rain of biblical proportions, here in Maine the weather was in the 70s F during the daytime, 50s F during the night, and dry. Other than those pesky deerflies and midges, it was just about perfect. 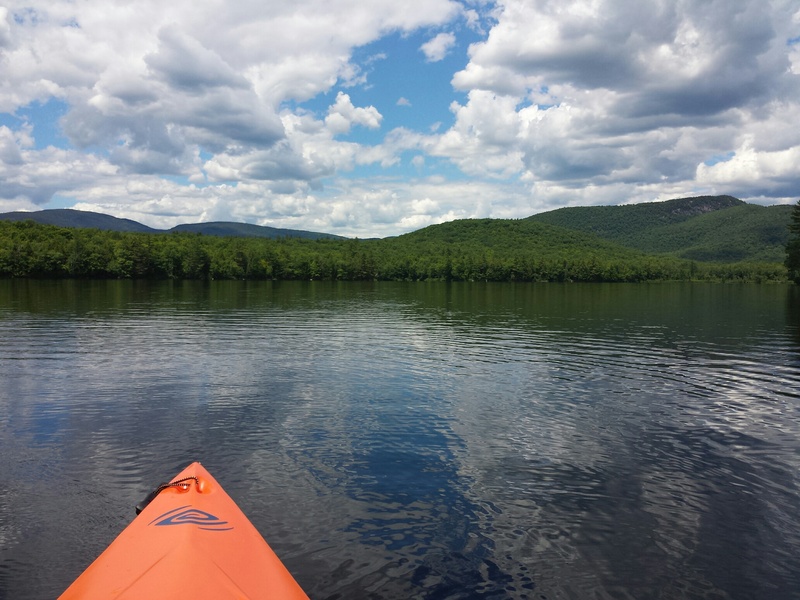 So I decided to make the most of my day and do some serious kayaking and fishing on 3 nearby lakes: Kezar Lake, Kewaydin Lake, and Virginia Lake, located 2 – 6 miles from my home. I didn’t last very long on Kewaydin Lake. The wind picked up and the water became very choppy. I love adventure, but when I’m out on the lake by myself with no people around, I don’t take chances. I always wear a life vest, even when it’s very hot and the water is calm and it would be more comfortable to not wear it. In the colder months especially, I keep my kayak close to the shore. If the sky turns ominous and looks like there might be a thunderstorm, I head back to the car. And if the wind produces lots of chop, I also call it quits. Being safe is a lot more sensible than death by drowning, hypothermia or electrocution. (I’m not being melodramatic here.) Fortunately for me, there are always other opportunities to go kayaking on more favorable days. 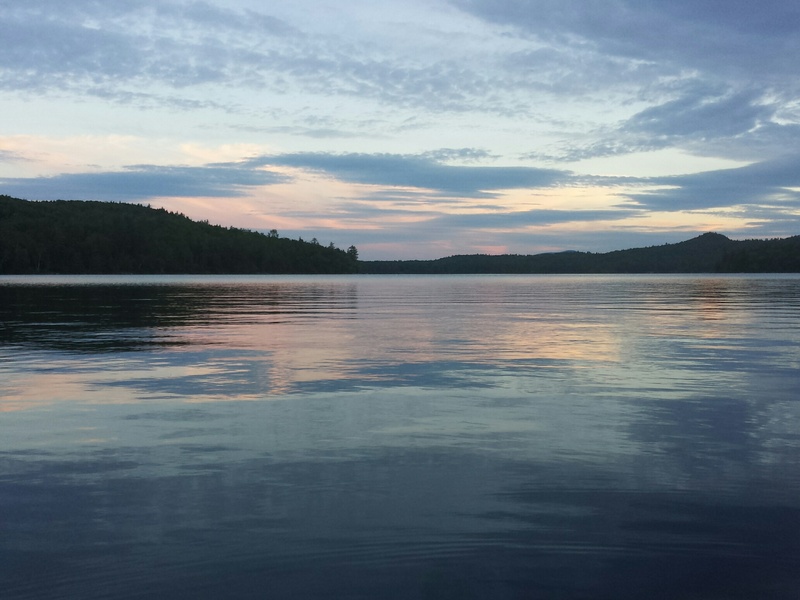 I decided to try Kezar Lake by the Upper Bay. Much of it is protected by coves and islands, although there is often chop in the middle of the lake or sometimes a lot of turbulence caused by speedboats taking joyrides. But I was lucky. Other than a father and son fishing by the dock, there were no one else around and no boats on the lake, and the water was smooth like glass. It was fun to watch the little boy – about 8 years old – catch and release fish after fish (perch, hornpout (the local name for catfish), sunfish, trout, and bass! ), with his dad puffed up with pride at his son’s successes. 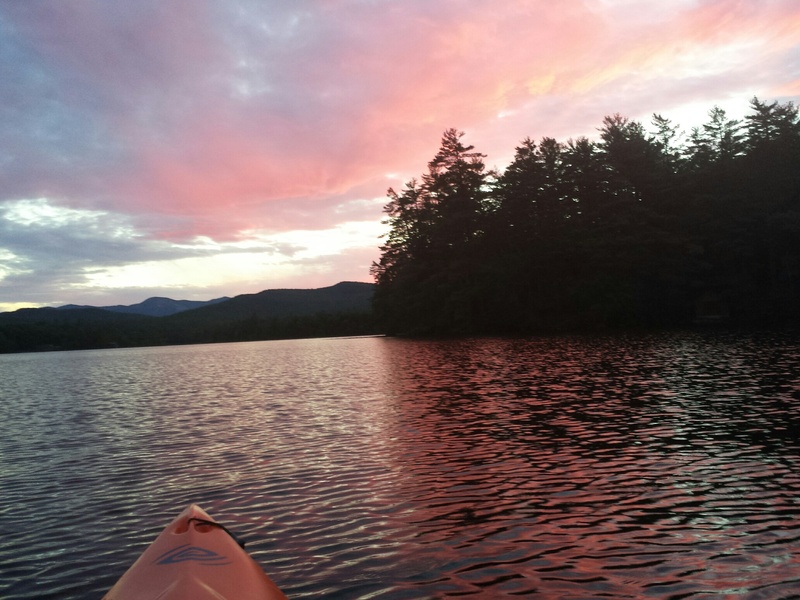 I was so mesmerized by the silence, the beauty, the fresh air, and the rhythm of my paddle, I completely lost track of time until the sky turned pink and orange as the sun fell behind the mountains, and the water glowed with the sky’s reflection. I remember thinking how I wished I could have taken my blood pressure at that point because it had to be at a record low; I was so completely relaxed and at peace. It was dark when I loaded the kayak into the car and headed home. The next morning I headed to Virginia Lake. This is a bit more off the beaten path and again, I was the only one on the lake. After a few hours of blissful paddling, thick puffy clouds in white and steel grey started forming, and I realized that I’d soon have to leave lest I get caught in a downpour. So I paddled back to the put-out and fished for two 20″ trout who teasingly swam around my boat. The water was so clear I felt like I could have reached down and grabbed them. They did manage to nibble and steal my worms but I failed to hook them. As I packed up, I could not help but think that the past two days had been a huge gift, fish or no fish. I felt a profound sense of inner peace and purity of spirit. At the risk of sounding corny, dumb and naive, it made me wonder why anyone anywhere in the world would seek to wage war or choose conflict, if they could choose this. The 4 year old had no trouble reaching the top of Black Cap. 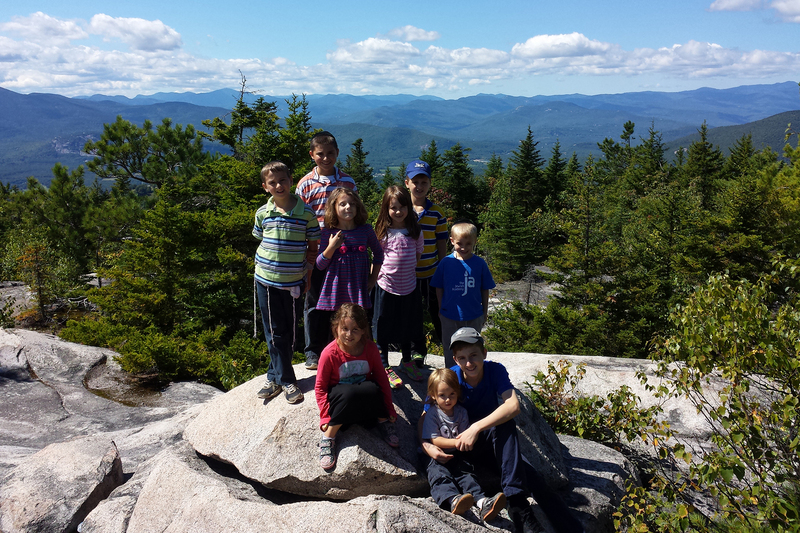 Although we had taken several long walks, my 12-year-old grandson suggested that we take a “real” hike, saying, “how can we say we’ve been to Maine and that we didn’t go on a hike?” He remembered last year’s hike to Black Cap Mountain and wanted to repeat it. It was easy to see why. 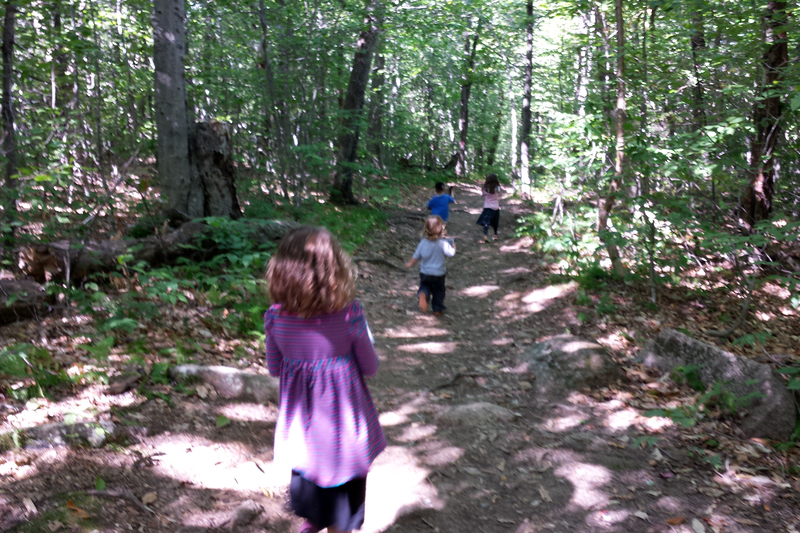 Black Cap Mountain is a great introduction to hiking for children. It’s not long – only 1.3 miles each way – and the ascent is steadily upward enough to make kids put forth a bit of effort, but not so steep that it’s a killer. 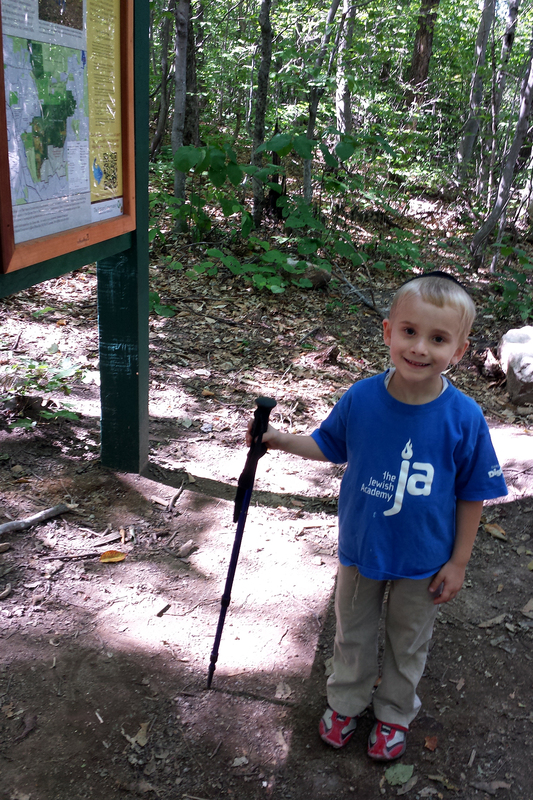 Really, a two-year-old can do this hike (but be prepared to carry your kid part of the way if they tire easily). It’s also suitable for older people – – I was privileged one day to witness a 94-year-old woman make the ascent. They all made it to the top! Besides the beautiful view, you are looking at a very special 8 year old. She experienced some serious orthopedic problems in her legs, which resulted in her legs being casted for several months, as well as physical therapy 3x a week. 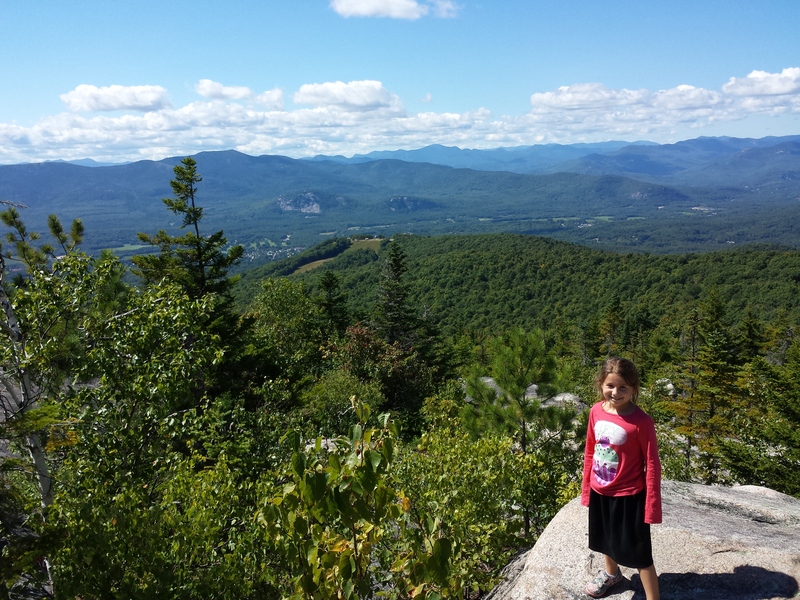 She had only gotten these casts off a couple of weeks before the trip to Maine, and the fact that she made it to the top of the mountain when her legs were weaker than normal only shows the incredible determination and strength of character of this kid! She never complained throughout her ordeal, either. Thank G-d she is fine now and back to normal. It’s always more fun to go down the trail than up! The little kid in the center is only 2. To get to Black Cap Mountain, one goes through the town of North Conway in New Hampshire, then heads over to Kearsage Rd to Hurricane Mountain Road. Hurricane Mountain Road is what they call a “seasonal” road, meaning it is not maintained (plowed) in winter and as such it is gated closed after the summer season. It’s extremely steep but the paved asphalt road is very well maintained for the heavy tourist traffic it receives in the summertime. Don’t even think of trying the road if you have a monster RV, but cars and motorcycles aren’t a problem. The dirt parking lot for Black Cap Mountain is at the highest point on Hurricane Mountain Road. (You can continue further on Hurricane Mountain Road all the way to the bottom on the other side, if you want to do a pretty country drive). The ascent is steep in places but gradual. 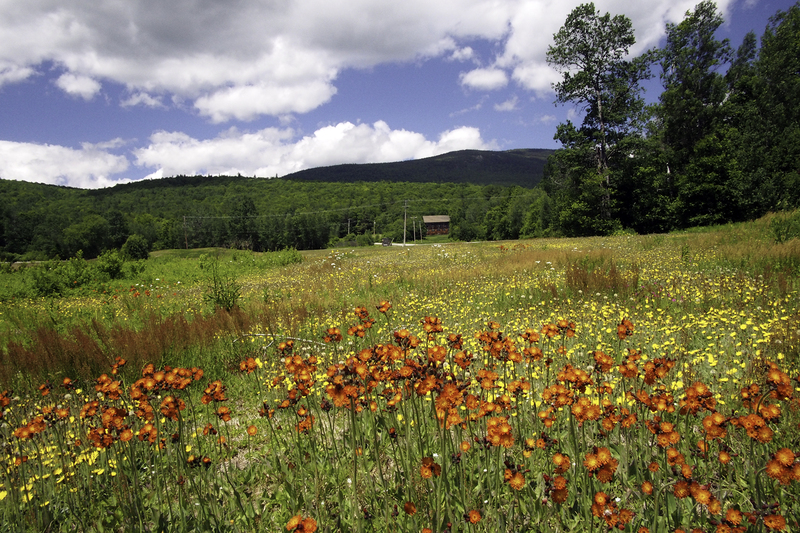 Once you get to the top, the views are stupendous of the White Mountains, plus the town of North Conway in New Hampshire. You can also see Maine and the many lakes of the Western District to the east and south. It’s also a great place to visit during leaf-peeping season. After we finished the hike, we made our way to Lovell Library where the kids checked out plenty of books to keep them busy over Shabbat. We also managed to have another kayaking expedition and swim in Kewaydin Lake. This would be our last day of activities in Maine, since Shabbat was coming and on Saturday night after havdala (the short prayer ceremony that bodes farewell to the Sabbath and ushers in the new week), everyone would be packing up and my daughter would make the long drive back to Baltimore. My husband and I spent Saturday taking a long walk of 2 miles with the kids (now that they were seasoned hikers) near our house so our daughter could have an hours-long uninterrupted nap, in preparation for the coming drive. She would be the sole driver with 9 kids in the car (seven of hers plus 2 nieces). The plan was to leave by 9:30 p.m. and arrive at her home early the next morning (it’s a 10.5 hour drive on average, but that’s without kids). A babysitter had already been arranged in her hometown so that my daughter could sleep and recover from the journey upon her arrival. The hope was that the kids would sleep through the night in the car, and fortunately, they did. Fewer bathroom stops meant much better time – – she was able to complete the trip in only 9 hours and 45 minutes, which is practically a record. 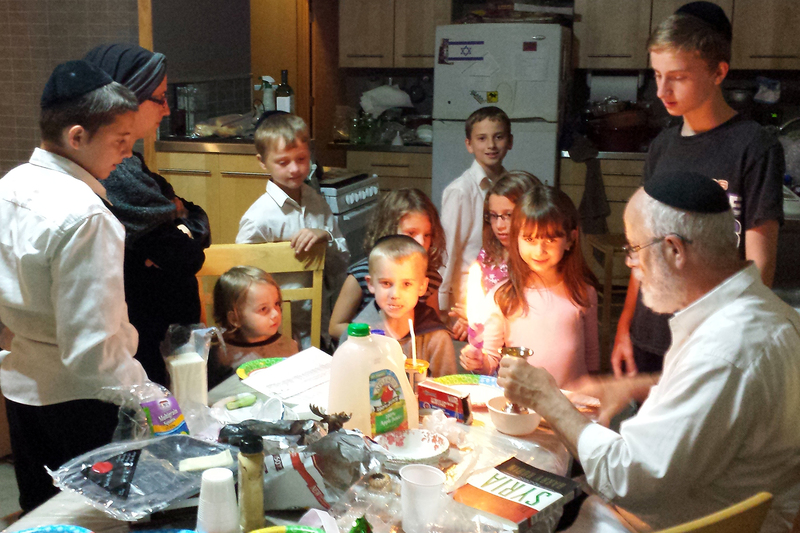 Havdala ceremony says goodbye to the Sabbath and ushers in a new week. 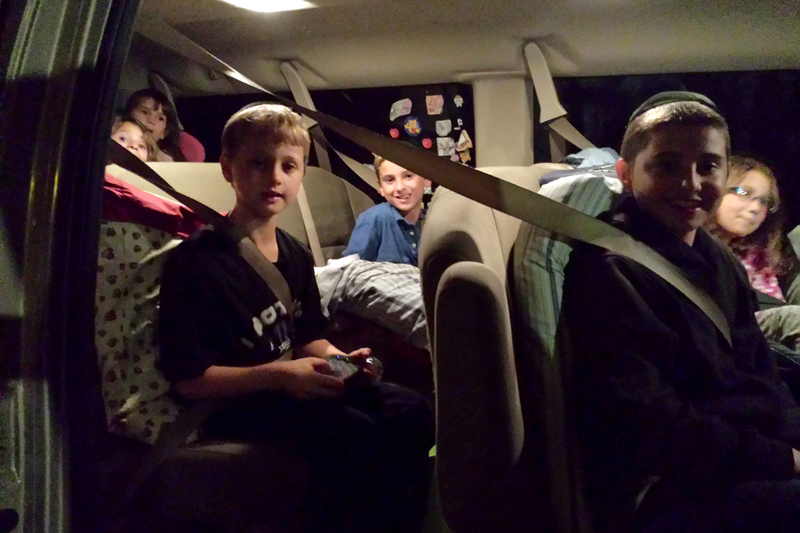 9:30 pm and the 12-passenger van is packed to the hilt as we say our goodbyes. Oh – remember that rash that my daughter had (see previous posts)? Well, it continued to get worse, but our days were so ridiculously busy that by nightfall, when the walk-in clinic was open, my daughter was too tired to go. By Saturday night it was huge (12.5″ x 5.5″), hot to the touch, and she was feeling achy and popping Motrin like candy. So instead of the much-desired nap upon her arrival once back at her home, she took advantage of having a babysitter to go to the Emergency Room, where she was diagnosed with Lyme disease! No, she was not aware of being bitten by a tick nor did she ever see one. There is a good chance that she was bitten by a tick in her home state, shortly before she came to Maine, since the rash began only on Day 3. 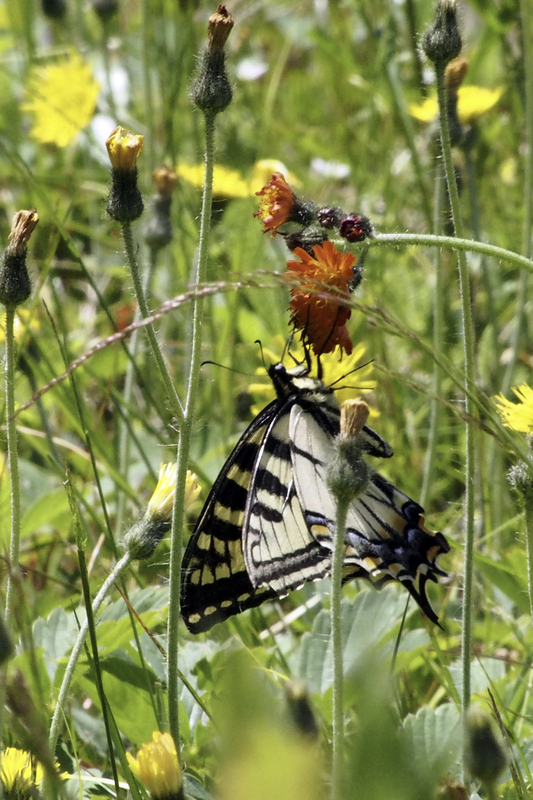 The other amazing thing is that the rash appeared on her upper abdomen, an area that is covered by clothing, and she had not been in tall grass. The moral of the story: you can never be too careful when it comes to Lyme disease prevention. If you have been outdoors in areas where ticks are known to be prevalent, then do a very careful body check before you go to bed each night, and don’t assume that long sleeves, pants, socks, shoes, and repellent are enough to prevent a tick bite! And don’t be stupid like we were – – at the first sign of trouble, get to a doctor for diagnosis so you can start treatment sooner than later, before real damage is done.